There's more to the new $8 million main runway at Porter County Regional Airport (VPZ) in Valparaiso, IN, than meets the eye. Its point of difference lies beneath the surface in a sub-base built primarily with materials recycled from the previous ailing runway via a process called full-depth reclamation. By opting for full-depth reclamation rather than more conventional full-depth reconstruction, airport officials estimate that they saved roughly $6 million in construction costs. Moreover, contractors finished the project about three weeks faster. In addition to saving time and money, the strategy put VPZ on the map for sustainability as one of the first airports in the country to employ the method-a notable accomplishment for a 718-acre general aviation facility that handles about 42,000 operations annually. Phase 2 Contractor: Rieth-Riley Construction Co.
Airport Director Kyle Kuebler explains that in addition to reusing existing materials for the new 7,000-foot runway, full-depth reclamation shrunk the project's carbon footprint appreciably because there was less need for emissions-producing trucks to haul away old pavement debris and also bring in new materials. Moreover, milled material that was not reused to form the sub-base for the new runway was deposited on sites around the airport where officials plan to build more roads. The project unfolded in two stages during 2015 and 2016, with Woolpert overseeing design and construction. FAA Airport Improvement Program funds paid for 90% of the project, the state of Indiana kicked in 5%, and the Northwest Indiana Regional Development Authority and Porter County funded the balance. In 2015, general contractor Walsh & Kelly rebuilt the intersection where VPZ's main runway meets its 4,000-foot crosswind runway. Crews also rehabilitated a portion of a parallel taxiway during the eight-week phase. In 2016, general contractor Rieth-Riley Construction Co. rebuilt the rest of the runway during an eight-week period. The first phase required the airport to close for nine days, but most flight operations continued throughout the second phase. "We stayed open by using our smaller runway," Kuebler explains. "It did restrict some larger aircraft from using the airport, but it kept us operational for 60% to 80% of our aircraft." This year, crews from Walsh & Kelly will finish rebuilding the main taxiway. "They're doing it in sections to ensure we have sufficient exit lanes," Kuebler notes. "Aircraft are back-taxiing on the runway until the taxiway project is complete." A full-depth reclamation may sound complicated, but it's not, explains John Baer, project manager for Aviation Design Services at Woolpert. "It's a fancy way of saying that we used the existing asphalt and sub-base material to create a new stabilized base for the new pavement," he explains. That said, the method is noteworthy. "A few other airports nationwide have used this process, but not very many," reports Baer. "It's relatively new in the airport world." First, crews pulverize a predetermined thickness of the existing asphalt pavement in-place and reshape it to the desired grades. Then cement is distributed over the pulverized material. Next, a machine blends the cement with the reclaimed base material and water. "The water starts a chemical process that hardens the overall mixture, which is anywhere from 9 to 11 inches deep," he says. "This becomes the new sub-base material." Crews then compact and fine-grade the materials in preparation for the pavement overlay. The new re-stabilized base needs up to seven days of curing time before it can be overlaid, Baer notes. One of the primary benefits of reclamation vs. rehabilitation is that it creates a stronger sub-base because it's more homogeneous, which eliminates underlying distresses, he explains. Furthermore, reclamation is dramatically more cost effective than full reconstruction, but it nevertheless provides a full-depth pavement solution, he adds. According to Woolpert, a full-depth reconstruction at VPZ would have cost about $14 million. By contrast, a rehab using full-depth reclamation cost about $8 million. 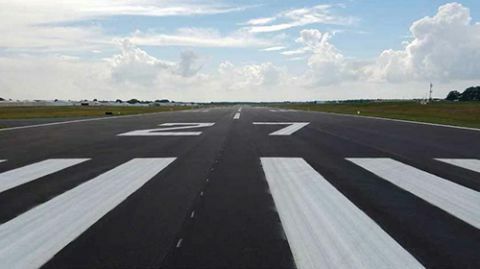 While savings vary widely depending specific runway conditions, Baer says that reclamations can cost 20% to 40% less than conventional reconstructions. "A lot of that savings comes from not having to remove all the old materials and haul in new materials," he says. "Being able to reuse what you already have results in pretty significant cost savings." Then there's the sustainability angle: Fewer trucks hauling away debris and delivering new materials results in less carbon emissions, plus less traffic on local roads. Before recent efforts, VPZ's main runway hadn't met FAA's 20-year life-cycle expectancies since it was originally built in 1966. In 1983, the airport rebuilt the crown and added an overlay, but the overlay began deteriorating in 16 years. Determined to resolve the problem, VPZ added another overlay in 1999, which also failed to meet expectations. "When the first overlay was performed in 1983, we used recycled materials that perhaps didn't give us the same quality that virgin materials would have provided," Kuebler reflects. "It resulted in very thick asphalt-12 to 16 inches deep-which is much thicker than it otherwise would've been." Adding insult to injury, the 1999 overlay deteriorated even sooner, lasting just 14 years. "We were getting worse with every rehabilitation," Kuebler observes. "So we had to identify what was going wrong and how to fix it." "It's an alternative to doing a traditional survey," Baer explains. "The mobile mapping uses LiDAR technology to scan the surface and creates a 3-D model that identifies all the distresses on the pavement's surface." At VPZ, the method flagged more than 200,000 linear feet of surface cracks, he notes. Test results revealed two major problems. The first was areas of weakness in the overlay, likely caused by the use of slag for the 1999 overlay. "Slag is generally okay as a base material, but not on a surface, because it's very porous," Baer explains. "That allows moisture-the biggest enemy-to get down into the pavement." The second issue was a distressed sub-base, also the result of water infiltration. Fortunately, full-depth reclamation is specifically designed to resolve sub-base problems. But because it's a relatively new procedure, VPZ had to get FAA approval for a modification of standards for the project, Kuebler says. With the overall project nearing completion in June, Kuebler says that he's very pleased with the results thus far. "The first two phases were completed on time and under budget," he reports. "And we finally have a primary runway-the bread and butter of our airport-that's designed and built to last 20 years, which meets FAA expectations." The FAA currently does not have standard specifications developed for full-depth reclamations of runways, but has approved the technique on a case-by-case basis. "It can be an effective way to reuse the existing base and sub-base material," says Marcia Alexander-Adams, an FAA spokesperson. "The FAA plans to further study the technique and issue a construction specification for it." In the meanwhile, Baer says he expects more airports to use full-depth reclamation. "It's a win-win situation-a great solution," he says. "I think we'll start seeing it used more in upcoming projects."